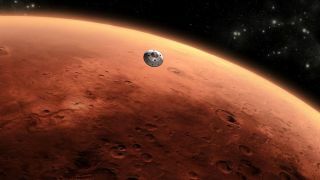 This artist's impression shows the Mars Science Laboratory spacecraft after its cruise stage has been jettisoned, roughly 10 minutes before it enters the atmosphere of Mars. NASA's newest Mars rover is less than a week away from its high-stakes landing on the surface of the Red Planet. With six days to go until Curiosity arrives at the Red Planet, project managers are bracing themselves for what NASA calls the riskiest part of the mission: the rover's harrowing descent through the Martian atmosphere to the ground. John Grunsfeld, associate administrator for NASA's Science Mission Directorate, took part in a news briefing on July 16 to discuss the MSL mission. He called Curiosity's landing "risky business." "The Curiosity landing is the hardest NASA robotic mission ever attempted in the history of exploration of Mars, or any of our robot exploration," Grunsfeld said. When Curiosity reaches Mars, the 1-ton rover will be lowered to the surface by a rocket-powered sky crane. This complex contraption will help slow the spacecraft's speed from roughly 13,200 mph (about 21,250 kilometers per hour) to zero in only seven minutes. This sequence of events is officially known as entry, descent and landing, but its nail-biting nature has earned it the nickname "seven minutes of terror." This type of unprecedented landing was selected because Curiosity is much larger than any previous rover that has been sent to the Red Planet. Curiosity's sheer size ruled out the possibility of orchestrating an airbag-assisted landing. The $2.5 billion rover will land in Gale Crater, where an enormous mountain called Mount Sharp rises from the center of the impact basin. As Curiosity treks around Gale Crater, and eventually climbs Mount Sharp, the rover will look for clues of past water activity in the region. Mission scientists are also keen to see what Curiosity finds as it climbs Mount Sharp, where layers of rock have essentially preserved the planet's changing environmental conditions, stretching as far back as a billion years or more. Curiosity is equipped with a suite of 10 instruments that will enable it to dig, take high-definition pictures, analyze chemical properties of Martian soil and rock samples, study minerals, and even shoot a laser at rocks to probe their chemical composition.